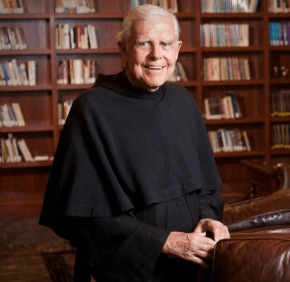 STEUBENVILLE, OHIO – Franciscan Father Michael Scanlan, whose name is almost synonymous with the Franciscan University of Steubenville, died Jan. 7 at Garvey Manor, a Catholic nursing home in Hollidaysburg, Pennsylvania, after a long illness. He was 85. The priest transformed the struggling College of Steubenville – now known as the Franciscan University of Steubenville – in the 1970s. He was its longtime president – from 1974 to 2000 – and then chancellor at the university from 2000 to 2011 when he retired. The school became a university in 1980 and changed its name in 1986.